Irrespective of federal climate change policy, California has redoubled its efforts to usher in the vibrant clean energy and greentech economy. Building on his predecessors’ leadership on air quality and the environment, Governor Brown has traveled the globe to mobilize subnational action on reducing carbon emissions, and the State Legislature has extended the landmark cap-and-trade program until 2030, and passed major transportation infrastructure legislation to incent the decarbonization of transport. Additionally, California Attorney General Xavier Becerra continues to file lawsuits against the Trump administration over offshore drilling and state fuel standards. 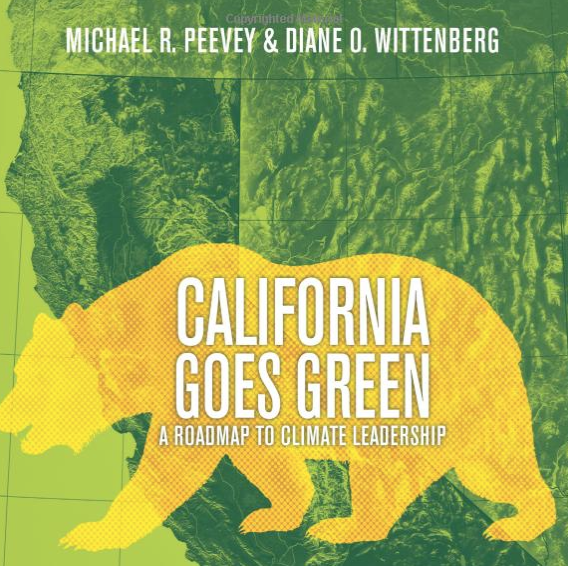 As efforts to implement and expand California’s current climate policies are challenged, what can and should be expected from state and local jurisdictions going forward? How resilient or impenetrable is California’s “Great Green Wall?" A sea-change moment is occurring for global clean energy, as the costs of alternative energy technologies continue to decline and meet the level of fossil fuels. California’s ambitious renewable energy targets appear increasingly realistic and pragmatic. However, the federal government—and the continued dominance of natural gas—would beg to differ. What are the policy drivers and coming legislation that will impact our power sector in the coming year? Is it really “Densify or Die?” When it comes to combatting climate change, city planning has an central role in shaping the low-carbon lifestyles and urban footprints desperately needed to curb growing transportation emissions. This roundtable will address what cities are, or should be, including in their General and Community Plans in order to provide a comprehensive and responsible set of incentives to guide emissions reductions in both the transportation sector and the built environment. Recent announcements from the biggest names in the auto industry have put electric vehicle development front and center. Some automakers have even pledged to release only all-electric or electrified vehicles by certain target dates, including hybrid engines that run on electric power some of the time. Emboldened by new funding sources and buoyed by declining battery prices, California leaders continue the push to achieve ambitious zero-emission vehicle targets through new electric vehicle infrastructure, increased renewable energy sources, and greater public awareness. As electric vehicles increasingly integrate with the home energy system, is California on the pathway to the electrification of everything? How will a major increase in EVs impact our existing grid infrastructure? At VX2017, Los Angeles County Supervisor Kuehl announced that the County intends to develop a funding measure in the fall of 2018 for multi-benefit stormwater capture projects. A year later, a funding measure program is in fact being developed to finance green infrastructure projects that would dramatically increase the region’s ability to capture and treat stormwater, while augmenting local water supply. 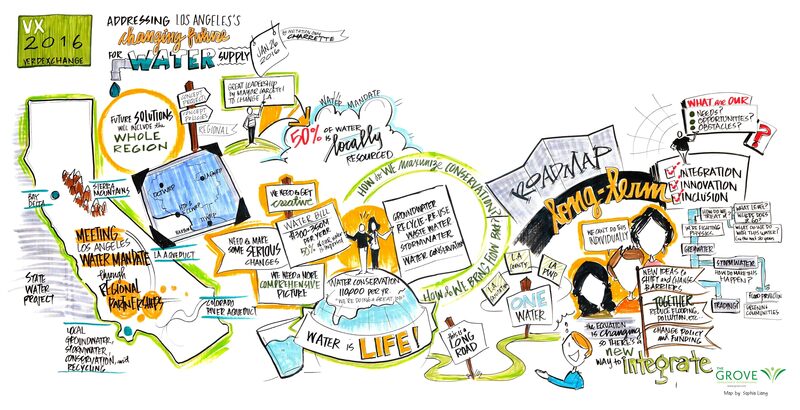 What are water managers envisioning? How is LA County’s measure similar or different from other water efforts nationally and globally? Will this new public funding be leveraged by private capital? And what are the challenges and opportunities presented by the process of achieving voter approval? As the future becomes more distributed and cloud-based, hear from leading experts in these budding fields that have potential to upend the current paradigm of resource delivery. How are institutions funding research for these early-stage disruptive technologies and platforms? Panelists will describe the transformative projects that are in the process of maturing in terms of their potential to solve challenges in the energy, water, and finance sectors. 2017 once again proved the disastrous consequences of an outdated electrical grid that left hundreds of thousands in Puerto Rico, Texas, and Florida vulnerable. In addition to protecting from natural disasters, the highly digital modern world also demands a grid that is more reliable and capable of providing high-quality power to major facilities like hospitals or data centers—where even brief brownouts can cost money or even lives. Microgrids provide built-in resiliency for energy systems during times of crisis—something that the Department of Defense has already learned. What lessons can businesses and municipalities learn from military-installed microgrids? This panel will highlight regional projects that are providing resilient clean energy even in this current political climate. **This session continues through 12:20 PM. There are 55,000 municipal water agencies in the U.S. Thousands are struggling with aging water infrastructure, public demand for improved operational control and efficiency, and planning and funding necessary system improvements. Clearly, the evolution to “the water utility of the future” is not without challenges. What lessons might NACWA, San Francisco, and Los Angeles share on how to leverage data analysis and systems integration to reduce costs, ensure resilience, better manage regional water supply, and ultimately, more effectively protect water quality? Alternative fuel and zero-emission vehicles represent just a fraction of the cars on the road today. However, the number of zero-emission vehicles purchased and deployed in California, the United States, and globally continues to rise steadily. In 2018 alone, more than two-dozen electric vehicle models will come onto the market, potentially shifting the tides for consumer adoption. In this session, hear from auto manufacturers, industry executives, and researchers as they discuss which technologies are best positioned, the steps needed to achieve successful EV charging infrastructure, and the impact of other changes in the transport sector. As California leaders propose legislation and regulations to help birth the battery storage boom, it may seem that natural gas power plants are going the way of coal. But U.S. natural gas production continues to rise, and has even contributed to decreasing national emissions. Indeed, the U.S. is thriving on the low cost and reliability of natural gas. How, then, are western regional utilities—charged with powering the sixth largest economy in the world—balancing environmental interests (wary of the damage of gas leaks) with the demands of a vibrant economy? With its clear economic and environmental benefits, energy efficiency should by all rights be an easy sell. But changing consumer habits and purchasing decisions requires proactive and innovative strategy. On this panel, experts will discuss market drivers for energy efficiency, best data-communication practices, and incentives that can result in reduced energy consumption while also helping utilities maintain stakeholder support, financial viability, and quality of service. The best way to make renewable energy an affordable, reliable resource—in all weather and at all times of day—may be the Energy Imbalance Market. Efforts to continue building a regional Western Grid stalled in the California Legislature last year, but that framework continues to be one of the most innovative models for expanding the role of renewables in the electricity market. This panel will address the regulatory and logistical challenges California and southwestern states are encountering in creating a Western Grid: modernizing infrastructure across the region, enhancing the resiliency and security of the electrical grid, crafting consistent regulation for multiple states, and building a system with the ability to scale—perhaps even nationwide. In 2015, the Los Angeles City Council approved the Mobility Plan 2035, which aims to revamp city streets to provide dozens of new bike and bus lanes, as well as more pedestrian friendly corridors. The ensuing controversy over the plan provided a glimpse into the competing interests taking shape in the rapidly evolving transportation sector: While planners and urbanists lauded the policy, many constituents voiced concerns about what it might mean for automobile traffic. This panel aims to unpack ideas about new, sustainable urban mobility, and its implications for housing, the environment, and congestion. This year, California surpassed 30 hydrogen-fueling stations, with another 30+ in the construction phase. The commercialization of fuel cell technology continues in California, nationally, and internationally—particularly in Japan, where the Toyota Mirai was developed. Hear from panelists about the research funding that enables fuel cells to become commercialized and continues to drive down the cost of hydrogen fuel-cell vehicles and stationary power. Is there a hydrogen economy on the horizon for medium- and heavy-duty transportation, and where does hydrogen fit within the future of the power sector? The news is full of claims about “energy breakthroughs.” California is blessed with an abundance of funded and innovative energy research supporting initiatives that focused on serving energy needs with less pollution, or with reduced social costs from hazardous waste. These innovations rely on the nexus between energy and IT. As the smart devices communicate with each other, how will this inevitably impact our lives at home and in business? Hear from panelists about the things that are here now (IoT, Integrated Solutions, Zero Net Energy), and the things that will arrive soon (Blockchain, Bitcoin), that will change the way we interact with the energy environment…and perhaps even with each other. In past years, advances in energy efficiency, distributed energy, and smart grids have prompted many observers—including past VerdeXchange panelists—to forecast a “death spiral” for traditional utilities. Today, California providers like SCE appear to be defying that prognosis by seizing on a new source of power demand: electric transportation. 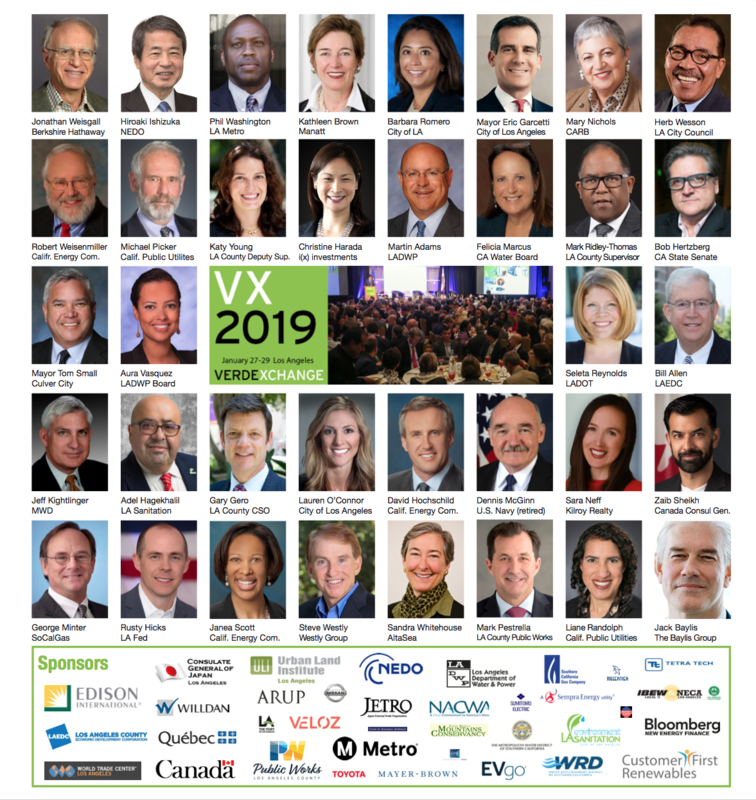 On this panel, the executives overseeing the nation’s largest shift to a distributed planning model, and the regulators crafting the future of energy policy in the state, join to chart a bold vision for the electrification and greening of California. Think globally, act locally. 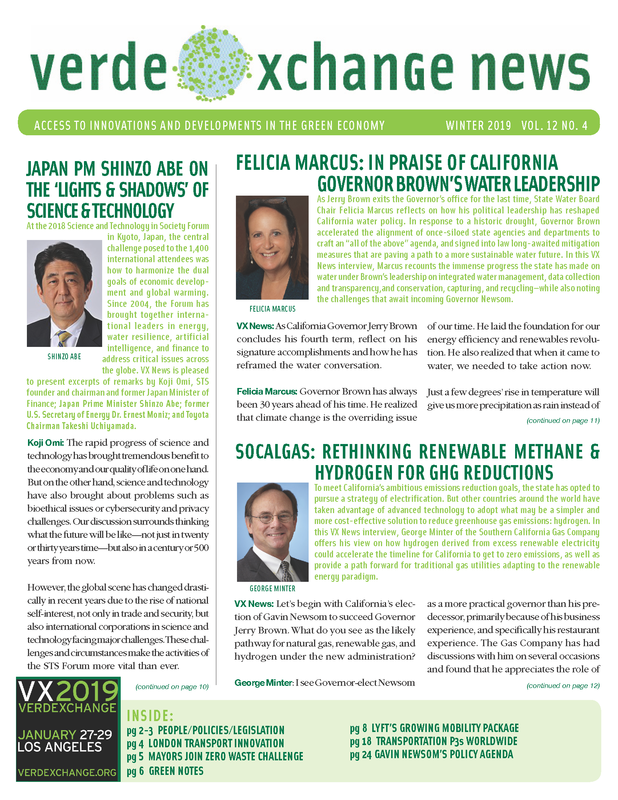 After a 2017 that saw California Governor Brown crisscross the world to build the Under 2 MOU coalition for climate leadership—which includes 205 jurisdictions, 43 countries, and $30 trillion in GDP—elected officials in national, provincial, and municipal governments are driving the markets for more renewable energy and EV infrastructure. While California continues to emerge onto the global stage, what are the pathways to building thriving green economies? Between intelligent buildings, smart meters, and self-driving cars, digital connectivity is increasingly inextricable from the fabric of our built environment. But with a ubiquitous network comes ubiquitous risk. Within the last year, unidentified hackers have targeted nuclear power plants throughout the U.S. and hit Ireland’s national power grid with malware. As our urban landscapes continue to transform into network of high-tech appliances, our most basic and critical infrastructure only becomes more vulnerable to security breaches, data leaks, system failures, and more. Resiliency efforts can no longer afford to overlook cybersecurity, and this panel will tackle what is required of public agencies and private partners in the new digital era to keep our infrastructure safe, operational, and secure. **This session continues through 4:10 PM. Whither traditional utilities in California? Competition in the power market is now about to flower. As of February 1, LA County is providing energy as a part of its LA Community Choice Energy model to 30 cities. Like Community Choice Aggregation (CCA) proposals are being reviewed throughout the State. The California Public Utilities Commission and other regulatory agencies are currently analyzing next steps for integrating community choice aggregation entities into the marketplace to provide localities with options to negotiate with energy generators and opt for more renewable energy sources for power. This panel will address both the promise and attendant issues arising from offering community-based options to consumers and business, especially when coupled with other developments like EV charging stations and efficiency rebates. California’s water system is at critical risk on multiple fronts: our infrastructure is dated, wasteful, susceptible to damage from earthquakes, and damaging to the environment. The California WaterFix could be the state’s largest water infrastructure project in a half-century, and will ensure greater reliability to Southern California. What will 2018 hold for the future of the debated WaterFix project? How will local efforts to increase stormwater capture play into the long-term water supply planning? What financing innovations will be used to complete the project? This past week, California Governor Edmund G. Brown Jr. signed an executive order to boost the supply of zero-emission vehicles and charging and refueling stations in California. The goal: get to 5 million ZEVs by 2030. Currently, California has 350,000 on its roads. Additionally, the Governor proposed a new eight-year, $2.5 billion initiative to continue the state's clean vehicle rebates and spur more infrastructure investments. At the same time, massive investments in rail infrastructure has the potential to reshape mobility in California. This session unpacks the three pillars of the coming transportation revolution, and the benefits that this market transition—if done right—could bring for individuals, communities, automakers, businesses, and governments. Two of the hottest new industries disrupting the global economy are also consuming vast amounts of natural resources. Bitcoin uses as much power per year as Denmark, while even before legalization cannabis accounted for 3 percent of energy consumption in California. As both sectors continue their rapid development, now is the time to build green technology, products, and practices into these burgeoning industries from the ground up. For cannabis, there are basically three aspects to consider for sustainable cannabis growth: energy consumption, water usage, and waste management. Cryptocurrency founders are now leading experiments to find more energy-efficient ways to create tokens. This panel will address the opportunity before us to transform what could be an unthinkable strain on our infrastructure and resources into a valuable sustainability enterprise. By 2021, indoor air quality will be a $10 billion+ industry. Countries around the world are moving to slash outdoor air pollution by banning diesel cars outright, and the public health impacts from unhealthy air are strains on the economy today. Clearly, from walls of plants to electric buses, cleaning the air is becoming good business. This panel will showcase emerging opportunities in the air quality space across the transportation and building sectors, as well as address how public policy can stimulate private investment and consumer adoption of clean technologies—so we can all breathe a little easier. As leaders look to balance growth and increase market opportunities in disadvantaged communities, new opportunities in financing are seeking to leverage existing resources to assist residents who have the most to gain from reduced energy bills and cleaner air. With the move to virtual net metering and deploying solar on multi-family units, California continues to prioritize investing in increasing access and career pathways in low-income regions. Going forward, what opportunities exist to use funding from cap-and-trade, municipalities, or philanthropies to stimulate opportunities for reducing GHGs and increasing shared prosperity. As new technologies stimulate additional potential to revolutionize buses and trucks, California state policy drivers created new funding sources to purchase clean heavy-duty vehicles for goods and people movement. 2017 saw a major investment in electric buses by Los Angeles Metro, and other jurisdictions are leading the way in clean air public transport options. As electric vehicle manufacturers announce major plans to manufacturer semi-trucks for goods movement in the next year, a number of near zero emission heavy-duty technologies already exist in today’s marketplace. How will autonomous vehicle technology impact existing systems and help regions achieve clean air goals? Just as political leaders have galvanized around the importance of subnational action on climate change, sustainable agriculture has also continued to look for local solutions. Localizing the food supply ecosystem has become an economic or job creation opportunity, as well as a method to address social equity and combat climate change. From the Federal Farm Bill to East Los Angeles bodegas, what social and political structures are being considered to encourage urban farming and sustainable food systems? How are land developers supporting agriculture or residential developments that revolve around working farms? This panel will address how to ensure a healthy relationship between small-scale urban agriculture and traditional farming. For several decades, the public and private sector have worked together to play an essential role in developing and financing water, electrical, transportation and social infrastructure. As a result, we have robust architectural, engineering and construction markets. Our financial system produces efficient markets and our tax code has fostered a tax-exempt capital market that provides benefits to state and local governments. Yet, significant issues have emerged. Why are we experiencing significant deferred maintenance backlogs? How can public agencies take advantage of new technologies that can enhance the public service that our infrastructure is meant to enable? Can infrastructure investment play a role in addressing challenges posed by climate change? What changes are necessary to the ways that public and private sectors have partnered in the past? The notion of intentional water management in California continues to gain traction as leaders deal with climate change and weather extremes. From a flood control perspective, California must deal with those wetter wets, but from a water supply perspective, the state must also figure out how to get water into the ground as quickly as we can. As experiments in spreading grounds, groundwater recharge, agricultural innovation, and stormwater capture continue, what are governments doing to incentive international water management? How can urban Los Angeles learn from other regions to find creative solutions? The San Pedro Bay is home to two mammoth ports – Los Angeles and Long Beach, which collectively form the 5th largest port facility on Earth. They have also been world leaders in how to embrace environmental responsibility in real and tangible ways. Both continue to compete to be “the greenest port in the world.” But remember that implementing their ambitious Clean Air Action Plan will not be easy or cheap. What motivates hard-driving business people to push so hard for environmental excellence? Hear from the leaders that are driving innovation to keep their ports stay competitive in an ultra-competitive shipping world. **This session is by invitation only. The first iPhone app launched in 2008. Tech magazines touted that the mobile phone would replace paper and we would use our phones for our airline boarding passes, coupons, and more. In 2018, there are 2.2 million applications. Chevrolet’s green model car—the Chevy Volt—hit the market until 2010. Advances in solar technology included flexible nanoantenna, and a new type of bendy solar cell was developer by researchers at the A*Star Institute. Elon Musk, through SpaceX, launched the design competition for a sub-scale Hyperloop prototype. At that time, driverless cars and unmanned aircraft were still science fiction to mainstream audiences. What will the next 10 years hold for technology and innovation? How are LAX, Metro, and other public agencies planning to use the next 10 years to build on our success in hosting the 1984 Olympic Games? Los Angeles will serve as a laboratory for how mega-event planning can be accomplished over a longer time frame. As we look forward to welcoming the world to Los Angeles again in 2028, what new innovations are being considered and/or planned leading up to those games? Can Los Angeles achieve a Gold Medal in using the Olympics as a vehicle to make long-term improvements to our city? And, how can business benefit from these major investments, and the major sporting events that are planned for Los Angeles between now and then? As Los Angeles reimagines its historic Union Station—the “jewel in the crown” of the county’s expanding rail system—what can be learned from successful transit hubs around the globe? This panel will present the San Francisco Transbay Terminal and Tokyo Station as case studies in urban integration and attentive design that tactfully manages the flow of human traffic. As LA seeks to create a more dynamic Union Station that energizes its surroundings and catalyzes new development, representatives from San Francisco and Tokyo will also examine the financing and management demands of such an immense endeavor. The race to put self-driving vehicles on city streets is in full swing—which means now is the time for businesses, developers, and planners to get ahead of the trend. In a driverless future, what will streets and businesses look like? Will storefronts still line our streets? Will businesses still provide parking? Will easier commutes make it possible to locate outside of talent centers? And can current infrastructure models accommodate the inevitability of AVs? This panel’s thought leaders will discuss how cutting-edge vehicle technology will transform not only our lived city experiences, but our commerce as well. Energy storage isn’t new; batteries have been around since 1800, and, according to the DOE, pumped storage hydroelectric plants still account for about 96% of all the energy storage worldwide today. What is new today is what we want to do with energy storage. Today’s challenges, driven by the emergence of wind and solar power generation technologies, are markedly different than those of the past. How do we fix the over-generation of renewables? By “shooting the duck” with energy storage: When you have too much power, just store it and use it during a subsequent period of high demand. This panel will tell us more about the latest technical breakthroughs in energy storage, as well as some of the innovative ways to deploy storage to allow more renewable energy to supply the grid without compromising reliability, safety, or cost. California has 840 miles of coastline, home not only to iconic beaches but also vital infrastructure. Recent studies have shown that this state will be hit harder by rising sea levels than other coastal regions. Scientific American states that under the lowest estimate sea levels in San Francisco would rise one foot by the turn of the century. The following panel will discuss various methods of resiliency being discussed today in cities that are investing in protecting their infrastructure and how regulators are preparing to enhance resiliency to our energy and water supplies. This panel will focus on large-scale and campus projects, both residential and commercial, that incorporate truly state-of-the-art energy technology. Microsoft’s 500-acre campus renovation in Washington will serve as a case study of a project that pushes the limits of energy efficiency, generation, storage, and surplus resource exchange. Panelists will address the challenge of maintaining favorable cost-to-ROI ratios over the lifespan of smart buildings, as part of a comprehensive picture of how to wisely bring major, innovative projects to fruition. In 2017—a year punctuated by natural disasters at home and abroad—it became clear that the preventative field of resilience still has a lot to learn from disaster recovery. On this word-class panel, resilience experts from Houston and Mexico City will examine where developers and building owners fit into long-term economic recovery, asking: How can we implement and advocate for policy measures that go beyond survival—allowing buildings to reopen and business to return to normal? Los Angeles Mayor Eric Garcetti this year announced a final slate of projects for his “28 by 28” initiative, all to be completed before Los Angeles hosts the Summer Olympics in 2028. And by 2025, California High Speed Rail plans to be bringing people from the Central Valley to Silicon Valley. But many details remain unclear about both the station plans and when these transformative projects will actually become operational. This panel will explore the planning challenges and benefits of fast-tracking these projects, as California redefines rail infrastructure for the rest of the nation. The promise of the Los Angeles River comes closer to reality each year. With AECOM’s Gateway Proposal, which stitched together numerous prior plans, a grand unified vision for regional leadership has emerged. Los Angeles County and City continue to work with State and Federal leaders, as well as the private sector, to manage water flows for both recycling and recreation. But the risks for getting the LA River right have never been higher. Will P3s financing be the solution for delivering needed green infrastructure? How can this project avoid repeating the mistakes of Chavez Ravine? How can we invest to uplift river communities—both north and south of Downtown LA? The Amazon Effect is a ubiquitous phenomenon increasingly impacting the retail industry—and it has major implications for the built environment. With recent innovations in transportation technology, developers and designers now have an economic and environmental incentive to design for new and unfamiliar types of distribution. Leaders in the industry will demonstrate how builders can best prepare for drone landings, centralized distribution, and night deliveries, offering predictions on the likelihood and timeframe for the application of these innovations. Smarter buildings require smarter choices in the materials we use to build them. How can developers reap the benefits of environmentally thoughtful construction methods and materials? Whether your goal is to improve indoor air quality by “growing” a wall, or to reduce waste by turning plastic into concrete, your options are more plentiful than ever. Join this panel discussion to hear what’s at the forefront of the materials market, and how you can incorporate these innovative products into your projects. The California Strategic Growth Council assists local government and entities around the state to fight climate change, promote health and equity, and conserve natural resources. Many of their programs provide needed infrastructure for the state, like the grants for Affordable Housing and Sustainable Communities, and Urban Greening. This month, the Strategic Growth Council awarded $140 million dollars for the Transformative Climate Communities Program in the cities of Fresno, Los Angeles, and Ontario, where place-based initiatives will carry forth GHG reduction projects in California's most disadvantaged communities over the next three years. Former Oceanographer of the Navy Admiral David Titley famously said “the ocean is the dog that wags climate’s tail” in reference to the circular relationships between the ocean and the atmosphere, the water cycle, and the impacts that climate change might have on communities around the world. To address the need for more ocean data, technologies are being developed that help to address these issues in more rapid fashion. From automated underwater vehicles, to droves, to satellites, to technologies that quickly identify ocean pollution, the Blue Economy is exploding. This panel will discuss how businesses, the sciences, and policymakers can intersect to ensure our oceans are understood and protected in the coming years. **This session runs through 2:45 PM. Multimodal transportation in urban areas is essential to a sustainable future—but even cities embracing high-tech, are still struggling to achieve it. Many are experimenting with transit access optimization, and integrating multiple modes into shorter local trips. Will the culture of Los Angeles and many other cities finally move past car ownership? How can people move past “mono-modal” daily transportation? This panel aims to reframe the conversation around multimodality and discuss future changes in technology, infrastructure, and policy that will make multimodal transit more feasible at both the neighborhood and regional scales. Question: Has there been a shift in city government culture? The smart city model addressed by this expert panel of public sector managers aims to unpack and share how initiatives to utilize improvements in technology and data collection are, or are not, enhancing city management and citizen well-being. Also shared will be their perspectives on how best to balance surveillance and privacy, methods with efforts to implement smart city initiatives, and how to create economic growth utilizing big data. The World Bank is today planning to incorporate storage into its utility-scale solar program, Scaling Solar. The program will assist regions throughout the world that suffer from grid capacity constraints during periods of peak energy demand. Here in California, state leaders are investing in research on the optimization of solar + storage technologies. Will 2018 continue the trend of seeing utility-scale solar + storage present as viable solutions to peak energy demand challenges? How can financing models leverage existing solar programs to deploy critical energy storage that can make the grid more resilient? Walter Marks III, Walter N. Marks, Inc. Parking policy in Los Angeles—and in cities around the world—is in desperate need of visionary reform. What will the future look like for today’s parking lots? Wasted Spaces, a recent publication from the Council of Infill Builders, called for reducing parking requirements and creating shared or joint parking programs. But how are developers implementing today’s parking technology innovations to better utilize existing urban land? This panel will explore these ideas, as well as the role adaptive reuse might play in a future when parking structures are no longer required. Climate action happens at the subnational level—in our cities and communities, governed by local and state laws, and implemented by businesses, citizens, and civil society. The Under 2 MOU is an agreement between more than 200 jurisdictions representing 43 countries and six continents, who commit to long-term deep decarbonization and to the Paris Agreement’s goal of keeping the rise in global average temperature well below 2°C. Governor Brown is a Co-Chair of the Under2 Coalition and will host the Global Climate Action Summit in San Francisco in September 2018, bringing together local and regional government, business, and civil society leaders from across the world to discuss what they’ve done to cut carbon pollution and make new climate commitments. Water suppliers are considering incentives to encourage privately funded infiltration that is consistent with water quality objectives. In addressing Low Impact Development goals and new stormwater permitting regulations, leaders are looking to industrial sources of water to become part of the water supply solution in Southern California. How should water quality and supply goals be balanced, and what governance system is in place to help bolster groundwater supplies? Finally, are there regulatory actions that can send pricing signals to the market that private investment in infiltration technologies will be supported and encouraged? As portrayed in novels, the California of the future is barely habitable. Brutal storms alternate with crushing droughts; mudslides and wildfires create waves of climate-change refugees. Fiction? Yes, California knows extreme weather. It has endured natural disasters, like floods and heat waves. But many scientists say the wildfires of the past week are not completely natural. In 2017, California suffered a string of the most catastrophic fires in its history; they obliterated neighborhoods and made thousands evacuate or lose their homes. Fire authorities were stunned by fast-moving blazes and tinderbox conditions that, as Gov. Jerry Brown said, “we’ve never seen.” The U.S. Forest Service has soberly stated that human activity has “completely changed the fire component of forest ecosystems.” With more than 100 million dead trees in California thanks to the drought and insect infestations, what new risks face the state going forward? How can environmental stewards, utilities, and municipalities better adapt to the changing climate? What resiliency strategies must be improved to protect human life and reinforce critical and natural infrastructure? As California cities look to better manage food and other organic waste, how can we evaluate the environmental and social impacts of different collection and management systems? This panel will share insights into the energy/waste nexus and the role of organic waste management in the context of food policy. Panelists will look at food waste management in terms of opportunities to generate renewable energy and to grow food and feed the hungry. In 2004, the first Chief Sustainability Officer in the United States was appointed at DuPont. Since then, both the private and public sectors have scrambled to prove their commitment to green operations by hiring CSOs. But how do sustainability offices actually operate within bureaucracies to make systemic changes in procurement and practices? And how can we tell if their efforts having an impact—on their institutions, on the market, or on the planet? This panel brings together sustainability officers employed by major cities, global firms, and leading universities to determine the best metrics to benchmark success, and to explore avenues for collaboration among sustainability leaders across sectors and industries. In 2016, Los Angeles County voters reaffirmed a commitment to funding the maintenance and creation of parks. Now, as implementation of Measure A continues, how are LA leaders maximizing this funding to combat urban heat islands, capture stormwater, revitalize neighborhoods, and provide health and economic benefits to residents? How does Southern California plan to use creative financing sources, community action, and adaptive reuse projects to bring about a new era of urban parks and provide more access to underserved communities? California devotes nearly 20% of its generated electricity and 30% of its non-power-plant natural gas resources to transporting, treating, heating and consuming water, as well as disposing of wastewater. Addressing the energy/water nexus is a tremendous challenge—and opportunity—for both our drought-stricken state and the world, especially given the potential of disruptive technologies like blockchain and realtime data to provide and maintain reliable water supply.